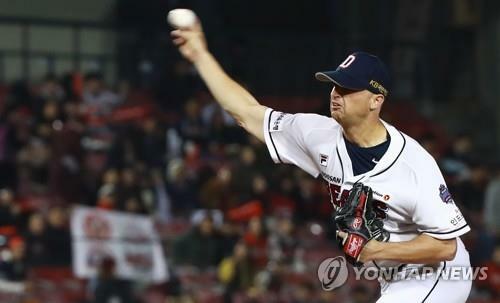 SEOUL, Nov. 5 (Yonhap) — The Doosan Bears defeated the SK Wyverns 7-3 to even the Korean Series at one game apiece Monday. Designated hitter Choi Joo-hwan smacked a two-run home run for his second straight three-RBI game, and starter Seth Frankoff struck out 10 in 6 2/3 strong innings for the victory at Jamsil Stadium in Seoul. The next three games of the best-of-seven Korea Baseball Organization (KBO) championship series will be played at the Wyverns’ home, SK Happy Dream Park in Incheon, just west of Seoul, from Wednesday to Friday. The Bears have the home field advantage after posing the best regular season record. In the 2-3-2 format, Games 6 and 7, if necessary, will be back at Jamsil on Sunday and next Monday. 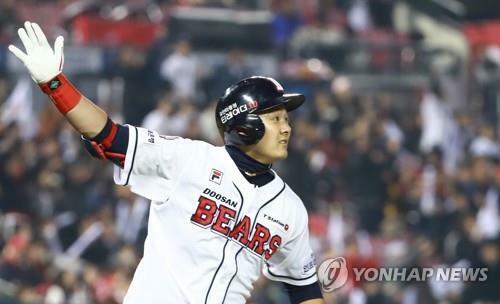 Choi, who drove in all three runs for the Bears in their 7-3 loss on Sunday, packed a heavy punch in this one, with his first career Korean Series home run against SK starter Moon Seung-won. He added an RBI single in the eighth inning for good measure. Kim Kang-min knocked in all of the Wyverns’ runs with a sacrifice fly and a two-run single, but the rest of the lineup couldn’t muster anything against Frankoff and the shutdown bullpen. Winning manager Kim Tae-hyung said the victory was the result of a complete effort. The Bears, who struggled to cash in on multiple opportunities in Sunday’s loss, opened the scoring in the bottom third. With the men at the corners and one out, Jung Soo-bin hit a hard grounder off starter Moon Seung-won right at shortstop Kim Sung-hyun. Kim made a fine grab on a tough hop and got the force at first, but speedy Jung beat the low throw to first base, as Oh Jae-il scored from third base. The Bears added three more runs in the fourth in more conventional fashion. Kim Jae-hwan opened the inning with a double to right, and Yang Eui-ji drove him in with a single to left, making it 2-0 to the Bears. Yang advanced to second when shortstop Kim Sung-hyun made a wild throw to home plate. But it didn’t matter where Yang stood, as Choi launched a two-run bomb to deep right field for a 4-0 Doosan lead. The Wyverns struggled to get much off starter Seth Frankoff, but rallied with a run in the top fifth, thanks to Kim Kang-min’s sacrifice fly. The Wyverns refused to go away and fought back with two more runs in the seventh, capitalizing on an error. With two outs and a man at first, Kim Sung-hyun hit a grounder down the third base line. Heo Kyoung-min fielded it nicely, but then bounced his throw past first baseman Oh Jae-il. That put runners at second and third, and Kim Kang-min brought home both runners with a bloop single to shallow center, cutting the deficit to 4-3. Frankoff walked the next batter and was pulled in favor of Park Chi-guk, who struck out slugger Choi Jeong to prevent further damage. The Bears added three more runs in the bottom eighth to put the game out of reach. After a walk and a single put men at the corners, Yang Eui-ji picked up his second RBI of the game with a single. Choi Joo-hwan followed that with a run-scoring single of his own, giving himself three RBIs for the day. Two batters later, pinch hitter Jung Jin-ho’s groundout made it 7-3 for the Bears. After Park Chi-guk, Kim Seung-hye and Ham Deok-ju came out of the pen to slam the door shut on the Wyverns. Batting fifth and sixth, Yang Eui-ji and Choi Joo-hwan combined to go 5-for-8 with five RBIs and three runs scored. SK starter Moon took the loss after allowing four runs on six hits in five innings. Third baseman Choi Jeong, back in the starting lineup after sitting out Sunday with an elbow injury, went 0-for-4 with three strikeouts. Designated hitter Park Jung-kwon, SK’s hero in Game 1 with a two-run homer, had one hit in four at-bats on Monday but struck out three times.